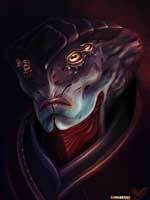 In December 2012 i stumbled upon the art of Ruthie Hammerschlag from New Jersey on dA, and was impressed by her detailed portraits of the Mass Effect series characters. During February 2013 i thought, they need to be featured on more places and want to know more about the artist behind them. This lead to the artworks being featured on Game-Art-HQ as well as this interview which was made in April already. In this article you can see all of the Mass Effect artworks featured on GA-HQ and learn about Ruthie , her motives and her art! Have fun reading and seeing her art! Hello! My name is Ruthie Hammerschlag, I am 24, I live in New Jersey and I paint as a hobby. I was always into art and I started doing stuff digitally when I downloaded photoshop onto my computer back in high school. I didn’t really know what I was doing so I tried to mimic techniques I thought were being done in my favorite paintings. In reality, I was just plopping colors down and using the smudge brush. A lot. It wasn’t until college that I started doing it more seriously. I was a fine arts major but I had one digital art class where I did my Eddie Vedder painting. I used new brushes and no smudging and was really happy with the result and it pushed me to try new things. That’s about when I started doing my first World of Warcraft paintings. Unfortunately, that community college didn’t have any other digital art type classes, and stuff at home needed more of my attention, so I stopped going. I got a part time job in a doctor’s office and did a crap ton of Warcraft fanart that got me a lot of attention. When I stopped getting commissions (and also when I got a little tired of it) I moved on to other things. Then later when I finally purchased my first gaming PC and got to play other games, I started doing other fanart, the latest being my Mass Effect series. I’ve gotten sidetracked by personal things and now I work full time in that same doctor’s office. But, the series isn’t done yet, I have a couple more portrait I want to do. 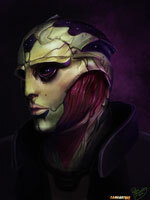 I was impressed by your series of the Mass Effect characters. 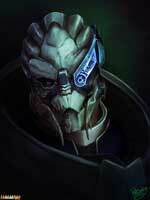 While i never played a ME game yet, your portraits made me curious about the designs of guys like Javik and their role in the games. – Thanks! You should play. DO IT. What were the reasons why you chose to spend so much time into creating these detailed portraits of so different looking characters? 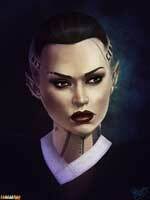 – I had done a couple portraits before of let’s see… Jack, EDI, and Tali. 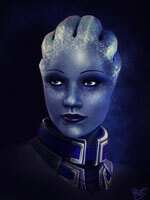 Oh and Liara of course. At the time I also did characters from other games in the same style. Something happened when the Omega DLC came out. 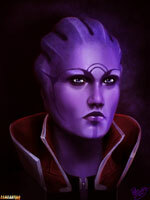 I really wanted to paint Aria, but I wasn’t feeling the style of my old portraits anymore. I wanted to do something serious, clean, and as accurate as possible. I wanted to push myself to try to make these aliens as realistic as I could. And I wanted to do all of them! Which is your most and which your least liked piece of your series (and why) ? Do you plan to portray other video game characters in the future and if another Mass Effect game will be released, will you continue your series? – Yes! After Bioshock Infinite came out I really wanted to paint Elizabeth, Booker and the Lutece’s. 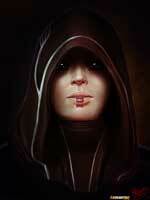 I also wanna do some more Dragon Age portraits. Guild Wars 2 has some really beautiful characters as well. 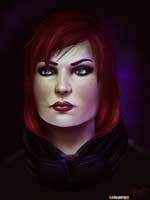 I might paint some Defiance folks too. I wanna paint everything, okay? We have 2013 but female video gamers are still mostly the ones playing Singstar, Wii Sports or Mario Party (own experiences) The Mass Effect series reminds me a lot at Star Trek with the many different races there. 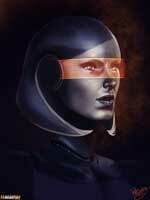 I got the feeling that the Mass Effect series seems to be designed for a male audience in general. What were the reasons why you got into the series? – Yes I am a girl and yes I play video games. Ha. I don’t know what you’re talking about, most of the gaming community I am around are female. There are a lot of arguments that Mass Effect is catered to men but I just like the game, you know? I don’t get involved in complaining about what I don’t like, I just play and enjoy to game for what it is, and I love it. I got into it because of Tumblr. I had just gotten my PC and Mass Effect 3 was coming out soon. Everyone seemed REALLY EXCITED. So I burned through the first two and fell in love. You are on deviantART now since a relative long time (8 years), how would you rate the development of the community? What do you like there and what do you not like so much? – I never really felt part of the community, unfortunately. For a long time I didn’t know anyone or have many views. I just shyly favorited and followed people I adored. And then I discovered groups. This was only a couple years ago. I joined all of the Warcraft groups I could find, and later all the Bioware ones, and got more love that I ever thought I would get. Still, I don’t really know anyone solely from DA. – My first love was World of Warcraft. I don’t play anymore but it always holds a special place in my heart. That and Mass Effect are probably my top two. Other favorites are Bioshock, Dragon Age, and Skyrim. I also played a lot of Diablo 3, SWTOR, and Guild Wars 2, but haven’t picked those up in a bit. I have a lot of other games that I started but haven’t invested a lot of time in yet. That’s a bad habit of mine. As far as characters, I always loved Sylvanas from warcraft because she’s a beautiful badass queen. I love love love Sylvari in Guild Wars 2. The whole character design is just beautiful. I also loved Eleanor Lamb in Bioshock 2 once in the little sister suit. I don’t know, I am a very visual person and I like character design more than stories I guess. Thanks a lot from my side as well Ruthie! I recommend everyone who liked these artworks by her to view her gallery on dA as well!